Direct Primary Care or Direct-Pay Medicine is the really nothing new. Some have called it the “oldest new idea in healthcare”. A doctor and patient working directly together was the norm before the advent and Medicare and third-party health plans of the 1980′s.These prepaid health plans (not really insurance) brought us impersonal networks, mountains of regulation, red tape and soaring costs. The “old fashion” system, now known as Direct Care, served us well for many generations and we didn’t have the rampant runaway medical price inflation that we have now. I say we get “back to the future” by restoring healthcare to the way it used to be; the way it works the best: One doctor – One patient – No interference! Below are some very well written articles about the subject and some data to go with it. I have referenced them to original sources where possible and/or listed the authors. If you are unfamiliar with the concept of the Direct-Pay movement, how/why it was re-invented and why it so integral to fixing our Health Care, then please read on. This is a must see. In this 4:49 video John C. Goodman explains not only the problem with our current third-party payment system, but how we got here and how to fix it. June 20th, 2013 – It was not that long ago, as late as the 1960’s in fact, when third party payers – insurance companies and the government – did not play such a large role in the American health care system. In those days, a majority of patients paid their doctors directly for primary health services while relying on other vehicles to pay for more extensive and expensive care. Many physicians strongly believe that direct pay care provided more efficient, more available, better and cheaper care than is usually available today.Under such a direct pay care system (DPC), patients shouldered more of the upfront costs for their primary care which helped keep overall insurance rates down for everyone. This also created an environment for more value-oriented decision making with a distinct disincentive to over-utilize the system. In short, the basics of a successful health care system, were rooted in a direct, transparent and trusted doctor patient relationship.As third party payers assumed more of the primary care expenses, insurance rates began to rise noticeably. And as patients began to pay smaller percentages for services while paying more and more for their insurance, the old disincentive was transformed to an incentive to spend; if patients paid so much for coverage why would they not seek to take advantage of their insurance benefits?The third party payer system requires that physicians hire employees just to manage the interface between patients and insurance companies or Medicare, expending precious human resources on non-patient care. Moreover, doctors are left to fight with insurance companies or the government in order to get paid for services rendered, sometimes waiting months to receive reimbursements.With the passage of the ACA, physicians are feeling even more crammed by what they see as an endless bureaucratic black hole and an increasingly heavy-handed federal government; ACA establishes over 100 regulatory boards and commissions certain to create countless new regulations as well as a far more complex billing system. This has created a new sense of urgency for physicians to find their own solutions. And in a growing number of cases, they are deciding to back to the basics of private medical practice – direct pay.DPC offices have been around for many years, but just after the turn of the Century, physicians slowly began adopting this model for their practices. The passage of the ACA has only accelerated that growth. 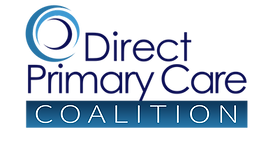 Today, physicians from Maine to Florida from California to Washington are re-recasting their practices based on the old direct pay model.Most DPC offices charge their patients a membership fee often less than $50 per month, with pediatric care below $20. Appointments for routine services may require small co-payments in the range of $10 and patients can obtain referrals for specialty care at greatly reduced rates.Patients then purchase high deductible plans solely for the more expensive surgical, hospital and high end testing procedures. Taken together with a direct pay relationship, patients can choose their own doctors, receive more prompt preventive care, experience a more transparent financial transaction and become better consumers of health care.From all indications, doctors and their direct pay patients are happy with their arrangements. It’s easy to see how much more efficient the direct primary care practice is for a typical primary care visit. This efficiency means lower costs, and doctors spending time with patients instead of insurance forms. What Can I Do To Support Direct Primary Care? We believe direct primary care is a vitally important solution to our nation’s health care crisis. We are working hard to make sure that legislators, government regulators and other leaders in health reform recognize and understand how direct primary care can lower costs and improve quality and access for Americans. The problem? Most conversations about health care reform focus solely on insurance options, which do little, if anything, to get to heart of the problems in our health care system today. We need your help to make sure that direct primary care is recognized as an integral part of our nation’s health care system. Americans, employers, and state and local governments need real alternatives and choices to elect the right type of coverage for their specific needs. This is tied closely to the thought process of a recent post in which I discussed the flawed idea of a problem-oriented health care system. When we treat a problem as the center of a person’s care, we look at one end in their care: fixing the problem (usually using a procedure). You may rightly ask the question: “To what end are you writing this blog post?” Touché. To answer that smart aleck question, let me go through several of the above bullet points for doctors who work for the usual employers: insurance companies and government bureaucracies, and those who work for my current employer: the patients. 1. To what end do I prescribe a medication? Q: Why give an antibiotic for an upper respiratory infection, or for “bronchitis” lasting less than a week? A: Because it takes too long to convince people they are not useful, and they have already waited for 2 hours to be seen and will be angry to leave the office without an antibiotic. I find I am far more likely to hold off on medications now, as people know I won’t force them to come back in if they get worse. The cure for antibiotic overuse is “watchful waiting,” in which the body generally gets better without medication assistance. The problem with the old system is that pesky first word, “watchful,” which implies paying attention (aka communication). Q: Why use a cholesterol medication? This, of course, is not the right answer for the sake of the patient. Cholesterol is a risk factor, not a disease, and there are plenty of circumstances where the risk heart disease or stroke is low enough that the of the medication becomes significant. I am now turning my patients’ attention away from cholesterol or other risk factors, and toward their risk. My goal is not to fix a little problem, but avoid a big one. 2. To what end do I make a diagnosis? It’s a really complicated topic, actually, made much worse by the need for diagnosis (ICD code) to get paid in many/most cases. Q: Is obesity a disease? A: It is as long as the insurers pay for the diagnosis. They never have in the past, but recently have been doing so more and more. I don’t actually care that much if it’s called a disease or not. To me, it’s something that increases the risk of certain things and reduces the quality of people’s lives. I don’t think it’s something that people should be ostracized for, but I also know that my weight struggles have been directly related to bad choices I make. The only reason to call something a disease is if doing so opens opportunities to reduce people’s risk or improve their quality of life. Q: What about symptoms like fatigue, irritability, or foggy-headedness? A: They go on the problem list as long as there’s an ICD code for it. Symptoms are not diseases, nor are they risk factors. They are a report of the person’s experience in life. Symptoms are significant only in context of a person’s risk. If a person has chest pressure and shortness of breath, is that significant? The answer to that question is different for a 20 year old female and a 56 year old male diabetic smoker. In the former, even classic angina is not likely to be heart related, while in the latter even atypical pain is taken as possible equivalents to angina. Again, it all comes back to risk. 3. To what end do I order tests? 1. We get the MRI and it is normal – in which case you still have pain in the knee that has not been addressed. I would probably refer them to surgery as I had suggested. 2. We get the MRI is abnormal – This would cause me to refer as well. 4. We don’t get one and the orthopedic doctor decides to go straight to arthroscopy. This would save you hundreds, perhaps more. Would I believe a positive or negative result? What would I do with a positive or negative result? So if I swab someone’s throat for strep and they have a high pretest probability (red throat, fever of 102, no runny nose or cough, exposure to strep) a positive test would simply confirm what I know, while I’d wonder about the accuracy of a negative test . On the other hand, if the pretest probability was low (the person felt normal), I’d mistrust the positive result. It’s the exact same test, but the result is interpreted entirely on the pretest probability. One more scenario in which a test is run is in the case of something that is low risk, but needs to be ruled out. This is generally done when the problem is too dangerous to miss (cancer in an adult, meningitis in an infant). It’s extremely important to have a very sensitive test in this case, that has a very low rate of false negatives. 4. To what end do people come in to see me as a doctor? Back in the day when I was paid by insurance companies, the answer often was, unfortunately: “because it’s the only way I get paid.” There are many cases where the care could have been given over the phone, but that would shoot my business in the foot. Unfortunately, you can’t take care of people if you can’t pay your bills. Even though the business was not my primary goal in terms of priority, it was the highest priority in terms of order. I first had to have enough money to pay my staff, our office lease, my salary, and all the other expenses, then I am free to give care. 1. The patient wants to. Some people just would rather come in and talk to me. I am not sure if this is due to my sweet personality or some chemical imbalance on their part (just kidding, of course). That’s perfectly fine with me. 2. I can give better care by having them here. The physical exam is sometimes important. Sometimes I need to be able to look them in the eye when I talk to them. 5. To what end am I people’s doctor? In my old practice the answer was often: to help them in case they are sick. The patient would probably say the same, with the addition of: so I can get medications and tests when I need them. To get my patients as old as possible. To keep them as healthy and happy as possible while they do the old-growing. The goal is no longer medical intervention, it is avoidance of care. The goal is not to treat problems, but to avoid them. The goal is not to order tests, but to not need them in the first place. The patient is my employer, and so my I do what keeps them happiest with my care. And that’s a nice world to live in. Rob Lamberts is an internal medicine-pediatrics physician who blogs at Musings of a Distractible Mind.